A main dish salad makes a fabulous meal on a warm summer day or evening. Many of these salads don't require cooking, and they are all hearty and delicious. Prepare one of these salads for a luncheon or dinner, or take one along to a potluck or picnic. This salad takes freshly boiled lobster to another level. 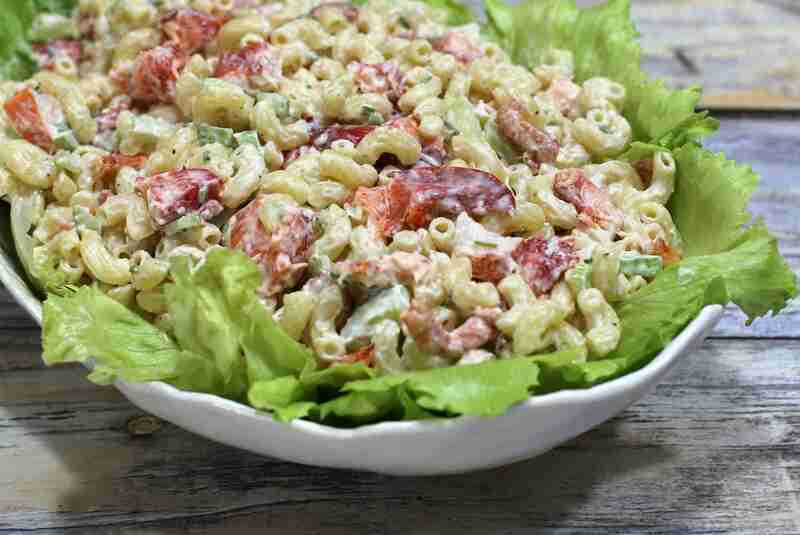 The lobster and macaroni salad is extraordinary and will definitely stand out at your next potluck. It's an excellent choice for a hot summer evening. The combination of bacon, lettuce, and tomatoes stands out in this delicious BLT macaroni salad. Hard-boiled eggs and chopped red onions add to the flavor and texture, along with a seasoned mayonnaise dressing. This interesting and versatile salad is made with a variety of ingredients: beans, cheese, nuts, ham, tomatoes, cucumbers, and romaine lettuce are a few worth noting. Serve this hearty chopped salad with ham and balsamic vinaigrette on tortilla chips and dress with the homemade vinaigrette or your own favorite. Chicken breasts Portobello mushrooms are grilled and then arranged with diced cheese and fresh vegetables. The tangy sour cream dressing is the perfect finishing touch to this grilled chicken and portobello mushroom salad. This Nicoise-style tuna salad with dijon dressing is finished with a tangy Dijon dressing. The combination of tuna with vegetables, hard-boiled eggs, and olives is classic. We love this salad with fresh grilled tuna, but premium packaged cooked tuna or good quality canned tuna may be used. This taco salad with dressing starts with seasoned, browned ground beef. The beef is arranged on plates with lettuce leaves and tortilla chips along with fresh vegetables, olives, and a homemade Southwestern-style dressing. The tortilla chips can be homemade or store-bought. Either way, the salad will be a big hit with your family! This easy shrimp salad with rice is a full meal in one cool dish. The rice, peas, and shrimp are the perfect combination of flavors, all brought together with a simple mayonnaise dressing. This classic lobster salad is great for a special occasion when you want to treat yourself or your family. Serve the lobster salad on a bed of lettuce with slices of avocado or fresh tomato wedges. Serve this extraordinary turkey salad with red grapes on mixed greens with fresh sliced vegetables for a cool and delicious supper salad. We love this salad with slices of avocado and tomato wedges. Asparagus and/or peas would make a great addition to this delicious macaroni salad with cheese and ham.